Holt is a charming market town located in north Norfolk. Both W. H. Auden and Stephen Spender attended Gresham's School which is situated close to the town. Gresham's is a boarding school (now co-educational) which was founded in 1555 by Sir John Gresham. Both poets later went on to study at Oxford University and became part of a group of left wing 1930s poets - often referred to collectively as 'MacSpaunday' - which also included C. D. Lewis and Louis MacNeice. 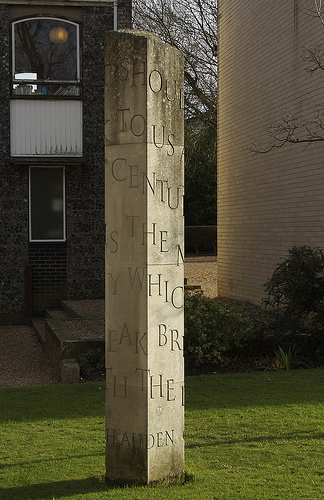 The school's theatre is called the 'Auden Theatre' and there is a memorial to the poet - made by Keith Bailey (2000) - which lies to the south of the school chapel. Auden described his schooldays at Gresham's in an essay entitled The Old School (1934). When we had left him in the hill. 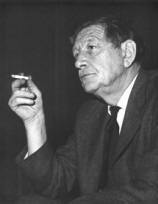 In 2007 a collection of Auden's early poems were discovered by John Smart (former Head of Art at the school) in old copies of the school magazine. Another literary Old Greshamian is the novelist, editor and one time restaurant critic John Lanchester. Gresham (the village) was also the location of a manor house owned by John Paston - one of the Paston family. However, the family lost possession of the house when it was forcibly seized by Lord Moleyns in 1449.